When teaching children every day is special and I love that! I love identifying and exemplifying each child’s individuality as I help them grow and develop. I have my Early Childhood Development Credential and I am CPR & First Aid Certified. I’ve been teaching since 2004. I am fluent in English and Spanish. I’m Mexican-American, born in Burbank and raised in North Hollywood. My parents are Mexican and came to the United States as teenagers. I have a wonderful husband who I married in 2016 after 9 amazing years together. I like to collect and read comics. I also like to collect Pop! figures and spend many many days/nights at Disneyland as an Annual Passholder. I like to take my Boston Terrier Nayana out for walks and love watching movies and tv shows. Ms. Vanessa teaches primarily in our Preschool. However, just like all our teachers you may see her interacting with any of the children. Her anniversary date is March 21, 2016. MS. Vanessa really listens when you bring up a concern or problem. I have seen her take my concerns w a thoughtful outlook and she truly tries to implement positive changes in an encouraging manner. I feel my son has slowly opened up w her and he said he likes her and Halsey. She's also been great with being available any time I have questions about my son's progress.. 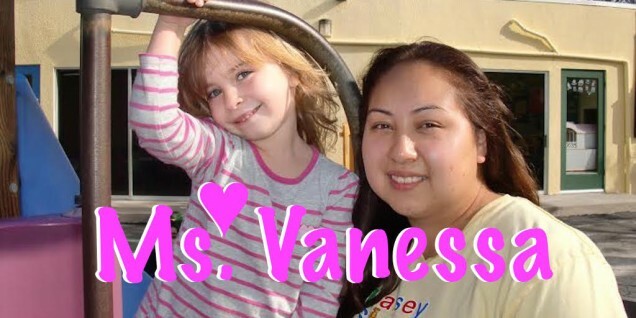 I'm happy w Ms. Vanessa and hope she stays w my son's class! Our son loves to go to "school." They make learning fun. He speaks fondly of his teacher Ms.Vanessa . Even at three, I still receive daily reports, which tell me how hr eats, sleeps and plays. That really helps me understand some of the activities he had in school and how much he ate or how well he napped . We are thankful he has such good caring staff and teachers . We highly recommend Helsey schools . Our son loves to go to school! Our son loves to go to school. They make learning fun. He speaks fondly of his teacher Ms.Vanessa. Even at three, I still receive daily reports, which tell me how he eats, sleeps and plays. That really helps me understand some of the activities he had in school and how much he ate or how well he napped. We are thankful he has such good caring staff and teachers. We highly recommend Halsey Schools.